Many analytical methods use a CW laser as excitation source. Physical principles of fluorescence, Raman scattering, absorption, Rayleigh scattering employ laser beam for transferring energy to molecules, thus exciting them or sometimes taking energy away. Where there is no need for high-resolution scanning or very uniform illumination, various laser beams might be used. But whenever it comes to having a good ability to focus or uniformity of intensity, just certain types of lasers can be picked. The visible and NIR spectral regions can be covered with either laser sources having continuously tunable wavelength, supercontinuum sources or smaller and much cheaper CW laser modules having discrete spectral lines from UV to infrared. In this article, we focus on compact CW lasers and their specialty. With respect to beam profile, continuous wave (CW) lasers can be categorized as having Single-Spatial-Mode (SM) or Multiple Spatial Modes (MM). Spatial modes are also referred to as ‘transversal modes’ or simply ‘beam modes’. These modes are explained here. Further, based on an operational principle, laser can be subcategorized as diode lasers or Diode-Pumped Solid-State (DPSS) lasers. Eventually, Integrated Optics offers both of these subtypes in four different modules - Free-Space (beam propagates directly from the laser module), Single-Mode Fiber (SMF; beam propagates through optical fiber, which supports only single spatial mode), Multi-Mode Fiber (MMF; fiber supports multiple spatial modes) and Polarization-Maintaining Fiber (PMF; SM fiber which is designed to maintain linear polarization during propagation). The H-BEAM option of diode lasers are offered with perfectly circularized and homogenized beam (XXXL-12A). The internal spatial filter not only circularizes the perimeter of the beam but also acts as a homogenizer and M-squared parameter is improved to less than 1.1. Fig. 1. Aspheric lens is being used to collimate a laser diode beam. Quite often CW lasers have a short cavity. The resonator of microchip DPSS lasers may vary from less than a millimeter to few millimeters. Cavities of single-mode laser diodes are in the range of hundreds of microns. Generally speaking, such short cavities produce highly divergent beams, which are not very usable in optical systems. The divergence requirement in microscopy and spectroscopy is often less than 2 mrad (full angle) or even less than 1.5 mrad. In order to meet this requirement of modern analytical instruments, laser beams have to be collimated. This can be understood as putting a lens or a set of lenses in front of the laser cavity – does not matter be it a semiconductor laser cavity or a short DPSS resonator. However, for different types of lasers (diode and DPSS) the beam specifications are completely different. A diode laser beam features low wavefront quality and high astigmatism - the divergence in the so-called fast axis is much higher than divergence in the slow axis. Various techniques are used for collimating such an astigmatic beam and in this consideration several objectives are important. The primary goal of collimation is to reduce divergence of a beam, secondary goal is to eliminate astigmatism as much as possible, third – to improve wavefront quality, fourth – to make the beam less elliptical, fifth – to maintain good focusability. The most simple and popular way is to collimate a laser diode beam by using a single aspheric lens. (see Fig. 1). The larger is the focal length of this lens, the larger will the beam diameter be after collimation. Futhermore, if a certain beam adjustment has to be made, for example in order to expand the beam radius of a collimated beam, two lens system is often used - the so called telescope. One lens with a negative focal length and the other with a positive one creates a setup to collimate and expand or shrink the beam. Quite frequently the most popular way to focus a laser diode beam is to use a two lens system where one lens collimates the highly divergent beam and the second lens focusses it. Alternativelly, a single aspheric lens can be used to focus the beam for direct focusing, but in most cases it causes severe aberrations, larger beam and lots of diffractions. By definition, beam quality implies a measure for how well a laser beam can be focused. For beam quality measurements in most cases a measurable variable M2 is being used and is defined as beam quality factor. It is a quantity that represents the degree of variation of a beam from a perfect Gaussian beam at the same wavelength, ideally 1. Most low-power DPSS lasers feature high beam quality, whereas high-power DPSS lasers have much higher M2 factor, as thermal effects become stronger in a laser crystal. Diode lasers tend to have poorer beam quality than DPPS, but low-power diode lasers M2 factor is still rather low - around 1.3. To conclude, for achieving best focussable (highest quality) beams, low-power DPSS lasers is the best choice. Semiconductor laser diodes have an oblong emitter shape. This is the main reason why the beam emitter by a laser diode features different divergence parameters. In the direction where the gain region is narrower, the divergence is higher, as compared to the broader direction. The axis with the highest divergence is called the 'fast axis', whereas the orthogonal axis is called the 'slow axis'. Collimation of such beam with a single lens makes the beam elliptical. In some operations, a rounded beam cross-section is much more desired than an elliptical shape beam. Usually, the first idea for collimating and circularizing a beam emitted by a semiconductor laser is to use two orthogonally positioned cylindrical lenses. As shown in Fig 3. One lens is placed to collimate the beam in the fast axis direction, another – in slow axis direction. The ratio of focal lengths of both lenses is related to the ratio of laser beam divergence in fast and slow axes. Even though this elegant way looks suitable, reality is different – cylindrical lenses must ideally be acylindrical, otherwise the beam will have some spherical aberrations. A pair of regular cylindrical lenses are used in practice mainly for MM laser beam manipulations, where aberration is not a worry. Fig. 2. Collimation using two cylindrical lenses (anamorphic lens pair). Talking about SM laser diode beam circularization, a pair of anamorphic prisms is often the case (see Fig. 3). A collimated elliptical beam can be circularized by either expanding in the slow axis of the ellipsis or compressing in the fast axis direction. After propagation through the prisms a minor lateral beam displacement occurs. Besides, in some cases the beam is transmitted through a circular aperture in order to circularize both its shape and intensity distribution. Fig. 4 displays transformation of a laser diode beam throughout the process. Other two methods will not be covered in detail, but are also widely used – attaching a microlens, e.g. a SM fiber to the lasing output will circularize an elliptical beam. In many cases, this method brings higher optical quality compared to the circularization by anamorphic prism pairs. A cylindrical microlens is capable circularizing elliptical beams of a laser diodes as well. Minor flaws occur using microlenses, as scattering is generated. Cylindrical micro lenses are small, but position and orientation need to be carefully adjusted and wave front sensor is needed for such operation. SM fiber coupling is another delicate way to deal with an elliptical beam. The result is distinguished by a very low wavefront error and, undoubtedly, is the best choice for applications where optical fiber is already needed. A SM or PM fiber acts as a spatial filter, which cleans and homogenizes the beam. Diversity in many cases confuses a buyer when it comes to choosing the right optics setup with both suitable price and beam quality. Let’s discuss concisely about the pros and cons of mentioned methods for achieving a wanted beam spot. When talking about two orthogonally positioned cylindrical lenses, these types of lenses are expensive and quite rare in the market. Also, these kinds of lenses will be thick, so higher aberration will occur, reducing the beam quality. A pair of anamorphic prisms can do the job and this setup is easy to find in the market, the only drawback of this particular setup for circularizing a beam is that a user must deal with the beam displacement and expansion (compression), which is not always wanted. Table 1. Comparison of different collimation methods for diode and DPSS lasers. Fig. 3. Two anamorphic prisms can either expand or compress the beam, regarding the direction it’s propagating. Fig 4. The shape and intensity distribution of a collimated laser diode beam change right before propagating through the prisms (a), after expansion or compression by a pair of anamorphic prisms (b), after clipping by a circular aperture (c), after a long distance propagation (d). If a laser beam propagates through some optical setup, this will alter the magnitude and type of beam pointing fluctuations, even if the optical components are completely stable. Nevertheless, mechanical vibrations can affect the alignment of optical elements, affecting the output beam. Thermal effects, especially thermal expansion of materials, can cause both direct and indirect beam pointing fluctuations. Such matters have significant effects for the optimization of pointing stability. This is why beam pointing stability of commercial laser products is often quantitatively defined. Most commonly used quantity is angular fluctuations per degree Centigrade. When considering ways to optimize beam pointing stability, various aspects must be taken into account for choosing a laser setup: how stable resonator mirrors are when mechanical vibrations occur, how well-heated components, such as electric circuits or diodes are refrigerated and isolated and how sensitive the laser’s beam quality is from the perspective of alignment. Pointing fluctuations are often reduced by careful alignment for maximum output power. Customers are often confused when they see beam profile images of diode lasers, especially in the near-field. In case a diode laser is collimated using just one aspheric lens, the beam in the near-field is strongly elliptical and the wave front looks distorted. Looking at these pictures customers start to think the focusability of such beam must be poor. Tests performed at ‘Integrated Optics’ showed that in the wave front quality becomes better after a longer distance of propagation or in a focal point. Herewith we provide 3 examples of aspheric-lens collimated laser diodes, where the beam was focused with a long focal distance lens (f=200 mm). The tests reveal that close to the focal point the intensity distribution in a beam cross-section becomes more homogeneous. Furthermore, the beam becomes round on both sides of the focal spot and is elliptical in a perpendicular direction (with respect to the initial ellipticity) in the focal plane. Fig. 5. Focusability of a single aspheric lens collimated 405 nm laser diode. The table shows beam diameters in vertical and horizontal direction as well as the calculated ellipticity. Fig. 6. 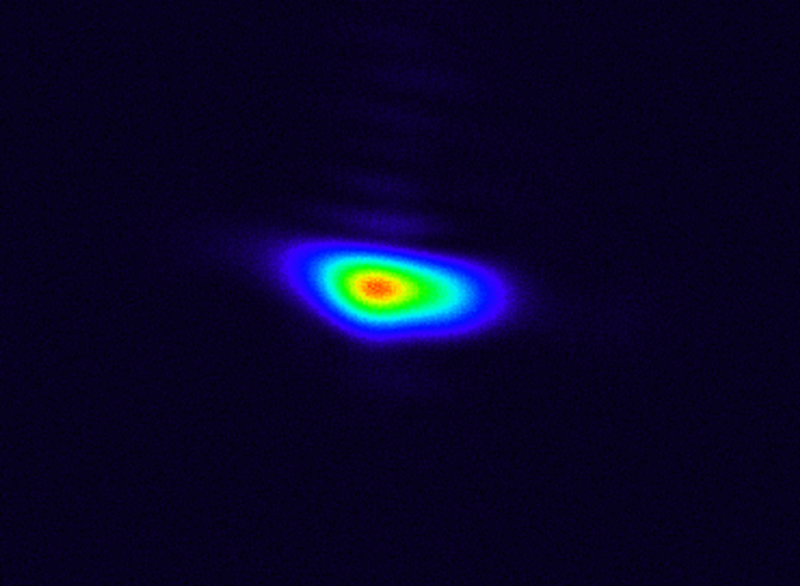 Magnified image of the focal plane of a 405 nm laser diode (please refer to Fig. 5). Fig. 7. Focusability of a single aspheric lens collimated 633 nm laser diode. The table shows beam diameters in vertical and horizontal direction as well as the calculated ellipticity. In the near-field the beam homogeneity is better as compared to the 405 nm laser, but has some tails in the vertical direction – this is also mainly a property of the diode itself. Fig. 8. Magnified image of the focal plane of a 633 nm laser diode (please refer to Fig. 7). Laser beams are different, depending on the type of a laser (diode vs. DPSS), laser power, the methid of collimation, and homogenization applied. Not all applications require a perfect beam, but those with high focusability requirements need either a beam from a DPSS laser or a well filtered beam from an SM laser diode. At Integrated Optics we offer several types of beam collimation. For demanding applications we always recommend SM/PM fiber coupled lasers, wheras fiber coupling is offered at very competitive rates, as compared to competition and provides much higher flexibility and virtually perfect beam quality. DPSS lasers have better beam quality in most aspects, as compared to diode lasers but are more expensive.